This packet of assorted pasta shapes used in this recipe was bought from NTUC Finest weeks ago, was to be added to my storage of pastas. I eat pasta quite regularly, to replace having rice instead, as pasta is lower in GI so as to feel fuller for longer. And, I liked this Vegeroni because it’s colorful that makes it imaginably appealing. The Vegeroni, “Veggie in Macaroni“, comes in different colours, shapes and flavors with the additions of vegetable powder. The green Vegeroni pastas were added with spinach powder, orangy red ones with tomato, plus the common wheat macaroni. It’s a healthier wheat pasta! As for the sauce, it is a combination of my previous recipe and an adaption from recipe listed the back of the pasta packaging. 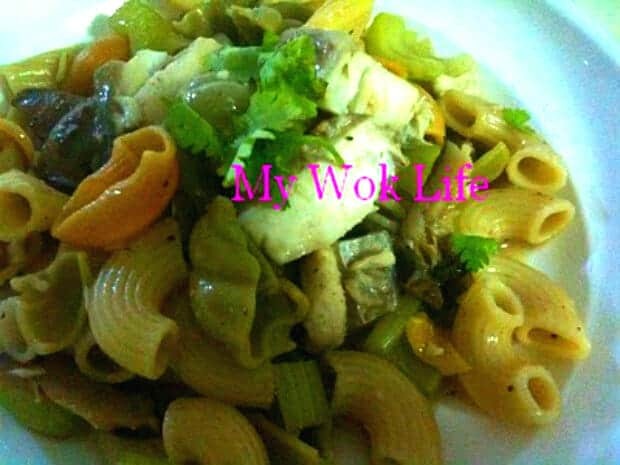 Added just some fish fillets and fresh Shiitake mushrooms to keep the dish simple, yet, flavorful without being too creamy. The use of milder cheese such as Edam cheese is to avoid the heaviness that might creates any sickly feeling, too. 1) Season fish fillet with pepper and chicken powder for 15 minutes. Then, combine well with potato starch. Set aside. 2) Heat large pan with olive oil and butter over medium fire. Sauté fish fillets till fillets turns white and lightly browned on both sides. Dish up and reserve for later. 3) Bring a large pot of water to a boil over high heat. Stir in salt and olive oil. Add in Vegeroni and cook for 6 minutes. Drain and set aside. 3) In the same large pan of Step 1, use remaining fat to sauté fresh mushrooms over medium fire. Then, return cooked Vegeroni to the pan. Add in chicken broth. Cover Pan with lid and simmer for 4 – 5 minutes, or until broth reduced and thickened. 4) Stir in cream and cheese. Season with salt and pepper and stir fry to combine well. 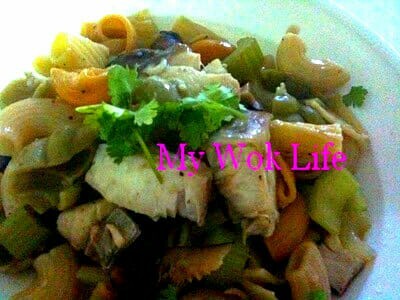 5) Reduce heat to low fire, return sautéed fish fillet to the pan and gently stir fry to combine all ingredients. Heat off. Dish up and divide into plates. Garnish and serve immediately. Variations: Use pork slices, chicken fillet stripes or prawns instead of fish fillet, as desired. * Choice of pasta types to your preference, too. 1 serving of my Vegeroni pasta counts about 450kcal. Tips: Replace thick cream with low-fat milk ( may thicken with adding some corbstarch slurry into the cooking after added milk in the wok, if find it too watery before dishing up).